Navy Secretary Ray Mabus announces milestone, EPA administrator issues a challenge at 2015 GreenGov Symposium. Navy Secretary Ray Mabus announced the U.S. Navy's new sustainability measures at the 2015 GreenGov Symposium. 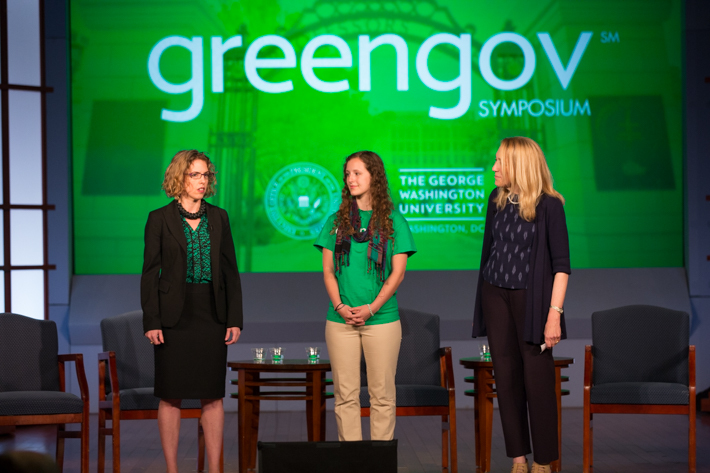 Nearly 300 leaders of federal agencies, industry and sustainability convened for the GreenGov Symposium Wednesday, brainstorming strategies to meet the far-reaching executive order issued by President Barack Obama in March on greening the federal government. Hosted by the George Washington University and the White House Council on Environmental Quality (CEQ), the conference gave government leaders the opportunity to consider the power, impact and challenges of sustainable practices on a large scale, according to GW Executive Director of Sustainability Kathleen Merrigan. An audience of 1,200 people tuned into the event via live stream. 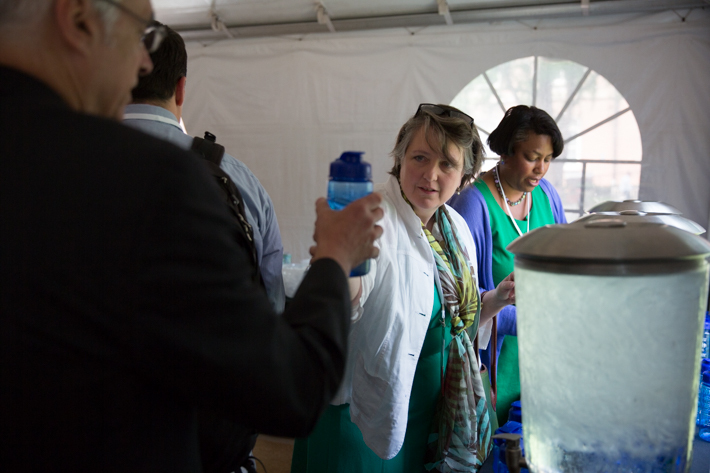 GW Executive Director of Sustainability Kathleen Merrigan and Dawnita Altieri hand out reusable TapIt water bottles during lunch. Calls for public-private partnerships for renewable energy projects, crowdsourcing platforms for green initiatives and agency-wide measures of progress were among the ideas volleyed as potential responses to the president’s 10-year mandate. The biggest example of action toward sustainability goals came from the U.S. Navy. 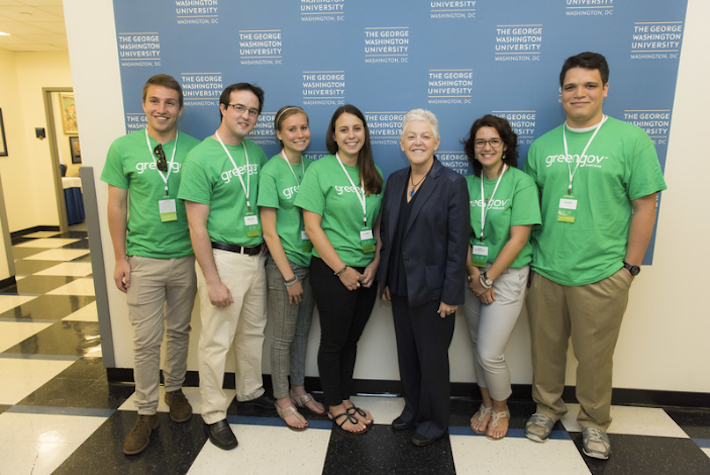 GreenGov volunteers with EPA Administrator Gina McCarthy. Navy Secretary Ray Mabus announced that the Navy was slated to meet President Obama’s goal of producing 1 gigawatt of renewable energy five years ahead of schedule. Mr. Mabus said the Navy is committed to deploying the “Great Green Fleet,” a collection of ships and aircrafts that will run on a blend of alternative energy, including nuclear power and bio-fuels. The Navy also is soliciting proposals for solar panel installations on rooftops and parking lots that will provide about 10 percent of the power used by Joint Base Anacostia-Bolling in Southeast D.C.
Public-private partnerships, such as those used by the Navy, will succeed because they are beneficial to the public and private sector, according to Beth Viola, senior policy advisor at Holland & Knight and chair of the GW Planet Forward Advisory Board. Ms. Viola said that strides in cost effective sustainable technology make it a “no brainer” for the private sector to get involved in large federal projects. Shawn Heath, vice president and chief sustainability officer at Duke Energy agreed. Mr. Heath said that much of the growth the company has achieved is a result of initiatives in the federal arena. He counted the Capital Partner Solar Project, a partnership among Duke Energy Renewables, GW, American University and the George Washington University Hospital, as an example of how successful renewable energy projects reduce cost and price volatility. Under the 20-year solar energy agreement, GW will source 50 percent of its power from solar energy by 2016. (l-r) Milken Institute School of Public Health Associate Professor Sabrina McCormick, GW senior Ellie Davis and Milken Institute SPH Dean Lynn Goldman. Moderators Amit Ronen, director of the GW Solar Institute, and Frank Sesno, director of the School of Media and Public Affairs and founder of Planet Forward, were among the GW representatives who highlighted the role of universities in influencing the future of sustainability. Milken Institute School of Public Health Dean Lynn Goldman discussed the benefits of working at GW’s new public health building, the first and only building in D.C. to earn a Platinum certification under the U.S. Green Building Council’s Leadership in Environmental and Energy Design (LEED) system. And GW senior and sustainability minor Ellie Davis showed a Planet Forward-produced video that chronicled her visit to the White House to meet with green leaders representing colleges across the nation. Sabrina McCormick, associate professor in the Milken Institute School of Public Health, also took the stage. She shared her efforts to “put a face to climate change” through the “Years of Living Dangerously,” a documentary series that debuted on Showtime last year. The second season of the documentary series is scheduled to air on National Geographic Channel next year. Looking ahead, Dr. Merrigan said that she is most excited about the case studies that GW faculty will produce examining exemplary federal sustainability efforts. The eight to 15 studies will be used for federal employee training and educational materials for universities. “It’s a great opportunity to advance sustainability and, at the same time, showcase GW expertise in the field,” she said.